The discovery of Jupiter's four largest moons by Galileo Galilei in 1610 spurred a huge debate because it cast doubt on the validity of the 2,000 year old geocentric world view developed in ancient Greece and made sacrosanct by the Catholic Church. According to Plato, Aristotle, and Ptolemy everything in the universe revolved around Earth, including the Moon, the Sun, the planets and the stars, in defined celestial spheres. Finding four objects revolving around a celestial body other than Earth made it evident that the traditional cosmological model of divine order was in urgent need of reform. Thus, together with other revolutionary observations, Galilei irrevocably opened up a new era with the Sun being at the center of the Solar System. Today, the four largest moons of Jupiter, and in particular Europa, are once again catalysts for a paradigm shift. Until recently the search for extra-terrestrial life was based on the concept of the “habitable zone” of the solar system. This concept defines the distance from a star at which liquid water is theoretically able to occur on a planet, which is thought to be a preliminary requirement for the origin of life. Solar radiation, however, is not the only energy source that keeps water liquid. Gravitation can yield the same result and giant planets such as Jupiter impart a great deal of gravitational energy to their moons, so much so that an ocean many kilometres deep is now suspected to exist below Europa’s icy surface. Such an ocean would be likely to contain more water than there is on Earth. Amanda Hendrix tells us about this mysterious ocean outside the "habitable zone" of our Solar System and ponders on the prospects for life in its depths. The field of ocean worlds has exploded in recent years, with the Galileo mission’s detections of subsurface oceans at Jovian moons Europa, Ganymede and Callisto in the 1990s and the Cassini mission’s more recent discoveries of subsurface oceans at Enceladus and Titan. Numerous other solar system bodies could host subsurface oceans, including the Saturnian moon Dione, Neptune’s satellite Triton and even distant Kuiper Belt objects. Ocean worlds represent distinct possibilities for the presence of life and are the focus of intense research and spacecraft mission planning. Here, we focus on the “original” ocean world – the body at which a subsurface ocean was first found - Europa. Europa is a moon of Jupiter of roughly the size of Earth’s Moon (radius 1,560 km). It was discovered by Galileo Galilei, along with the other Jovian moons Io, Ganymede and Callisto, in 1610　. Europa’s surface (dayside brightness temperature ~130 K, or -143°C, nightside brightness temperatures ~88 K or -185°C) is composed largely of water ice, though on one hemisphere (the “trailing” hemisphere), the ice is contaminated by a dark reddish material whose exact composition and origin are unknown - but which is the subject of intense debate. Europa's trailing hemisphere, demonstrating dark reddish fractures and regions, as seen by the Galileo spacecraft (Image credit: NASA/JPL). Europa, like Earth’s Moon, is phase-locked　, so that it keeps one hemisphere facing the planet Jupiter at all times. The “leading” hemisphere is the hemisphere facing the direction of Europa’s orbital motion around the planet; the trailing hemisphere is opposite to the leading. Europa orbits Jupiter within the planet’s strong magnetic field, and because Europa moves more slowly than the corotating plasma, the trailing hemisphere is constantly bombarded by the ions associated with the magnetic field. The ions and electrons surrounding Europa hit the surface and “sputter” surface water ice into a very thin atmosphere of oxygen. The radiation bombardment of the trailing hemisphere is likely related to the dark, reddish material there. However, Europa’s icy surface is criss-crossed with fractures, and many of these fractures seem to be filled in with the dark material, leading researchers to speculate that the dark material comes up from below the fractures. Intriguingly, in some areas (known as “chaos” regions), the ice seems to have broken up, a bit like icebergs, suggesting that some type of geologic activity has disrupted the ice in these regions. Europa’s non-icy material: Reddish-brown areas, including the "chaos" region below the large "X" shape, and along the linear fractures, may be recently geologically active (Image credit: NASA/JPL/University of Arizona). The disrupted icy surface regions were speculated, during the Galileo mission era, of being indicative of a dynamic interior – that the region below the surface was active. Overall, Europa’s surface appears relatively young, geologically speaking; the estimated surface age is ~40-90 Myr　(much younger than the ~4.5 Gyr　age of Europa itself). It has fewer craters and a brighter surface (a higher reflectivity) than the neighboring icy moons Ganymede and Callisto. This youthful appearance could signify recent or current geologic activity and could reveal clues about the processes occurring in the interior of this moon. 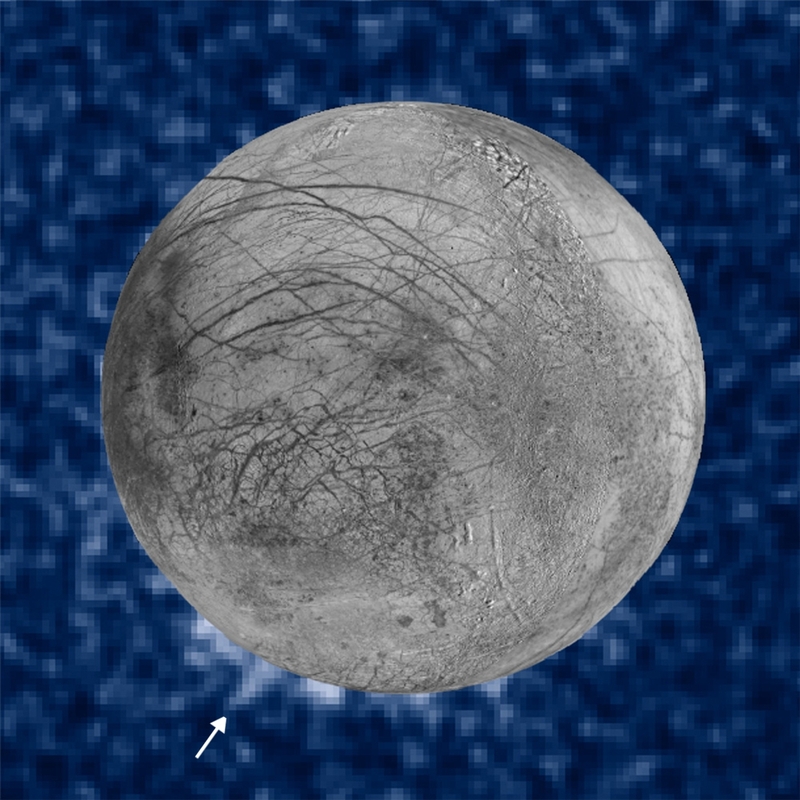 At Europa, the presence of a subsurface ocean was first hypothesized in the early 1970s . Though Europa’s surface is mostly water ice, the overall density of the body (3 g/cm3) is much greater than that of pure water ice, so it is known that the interior of Europa must be composed of denser rocky material with an underlying metallic core. This is important because rocky material likely includes radiogenic elements that decay over time, producing heat within the rock. At Europa, further heat is produced in the interior of the body by tidal interactions with Jupiter and the nearby moons Io and Ganymede. Similar to the Moon creating tides in the oceans on the surface of the Earth, tidal interactions on Europa produce tidal flexing of that solid body, with associated heating of the interior (The tidal flexing also is responsible for the fractures observed in the icy surface). At an icy world such as Europa, this internal heat can lead to melting of ices resulting in a subsurface ocean: an ocean underneath an icy surface shell. In theory, this internal heat and melting can happen at many icy moons in the solar system, depending on their size and compositional makeup, such that many ocean worlds are currently present in the solar system. Intriguingly, Galileo spacecraft results in the 1990s appear to have confirmed the theoretical idea of a subsurface ocean. The magnetometer instrument on Galileo was used to sense Jupiter’s magnetic field. At Europa, the magnetometer measured perturbations in the magnetic field lines that are consistent with a salty subsurface ocean. This subsurface ocean is consistent with the relatively young appearance of Europa’s surface, including the fractures and chaos regions – as if the icy shell could be floating on top of the ocean (or has done so in the relatively recent past) and can crack and break apart with stress or heating from the ocean below . In this way, ocean material can interact with fractures in the icy crust. The dark reddish material observed on Europa’s surface could contain salts from the subsurface ocean, likely darkened via radiation. Based on models of the interior structure, Europa’s subsurface ocean is thought to hold more than twice the amount of water of Earth’s oceans. The ocean depth is estimated to be ~100 km with a density around 1000 kg/m3; the ice shell is currently tens of km thick. In some regions, lakes may be present within the ice shell, produced by local heating and melting. Europa’s surface is likely relatively youthful in appearance because of resurfacing by some type of eruption of subsurface ocean fluids. In some scenarios, ocean material can access the surface via the fractures or thinner regions in the ice shell. An exciting prospect is ocean fluids being erupted via cryovolcanism – geyser-like activity such as is seen at Saturn’s ocean world moon Enceladus. Indeed evidence exists – primarily from the Hubble Space Telescope (HST) – of current day plume activity at Europa. Two types of HST observations have indicated possible plume activity: the first was the detection of ultraviolet emissions – akin to the northern lights here on Earth – where plume vapors are excited by magnetospheric electrons and “light up.” The emissions were seen in a specific region over the south pole, leading to comparisons with Enceladus’ south polar plume activity. Repeated such HST observations of Europa, however, have not found further evidence of a plume . The second type of HST plume detection has been observed on a handful of occasions: when Europa passes in front of Jupiter (as seen from the vantage point of HST), light from Jupiter is blocked by Europa, and a bit more light has also been seen to be blocked by an eruption-like shape above the surface of Europa . Europa plume. 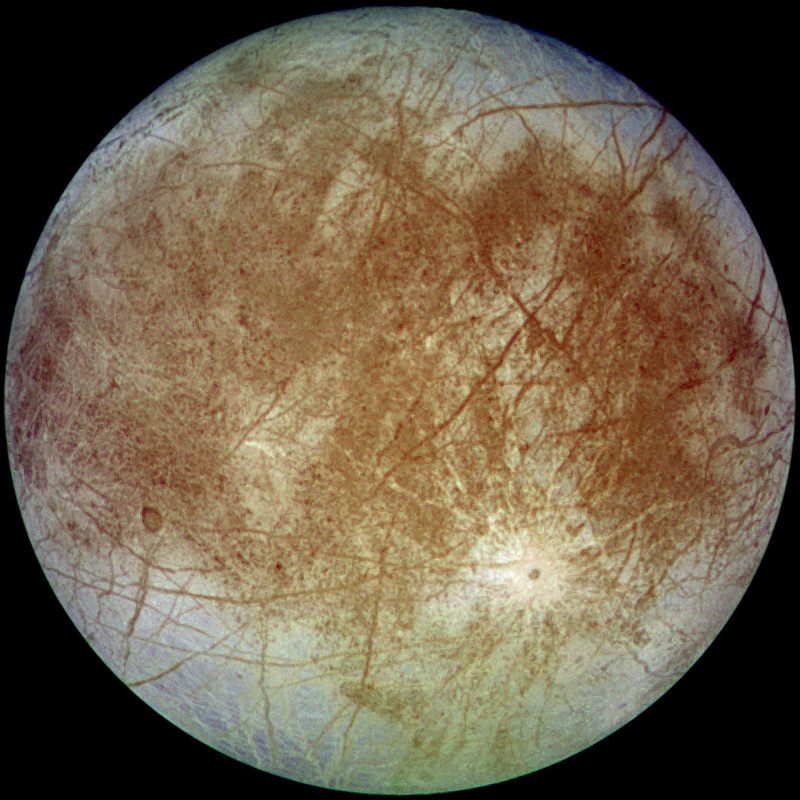 This image shows ultraviolet data from Hubble Space Telescope with a visible image of Europa superimposed. Near the south pole, the brighter regions off the limb of the body indicate where absorption, presumably by plume vapors, have been observed (arrow) (Image credit: NASA/ESA/W. Sparks (STScI)/USGS Astrogeology Science Center). What is particularly intriguing is that such a plume detection has been observed twice in the same location on Europa, and that location appears to be a region on Europa’s surface observed by the Galileo spacecraft to be relatively warm on the nightside (~95 K compared to usual nightside temperatures of 88 K). Could this be an active site on the surface? The presence of an ocean at Europa has stimulated speculation that life could possibly exist in such an environment. Europa’s ocean may have existed for roughly the age of the Solar System, which may mean that life has had a chance to begin and evolve there. Life as we know it has three basic requirements: liquid water, an energy source, and the essential chemical ingredients. Europa may meet these three requirements. As discussed, there is strong evidence that a ~100 km deep liquid water ocean exists at Europa, addressing the liquid water requirement. The tidal flexing occurring due to gravitational interactions between Jupiter, Europa, and Io provides the energy that could be used to drive chemical reactions to be used by life forms. Geothermal energy, which is the primary source of energy supporting life in certain deep sea regions here on Earth, could also be present on Europa if seafloor volcanoes are present. Some scientists have even suggested that a type of plate tectonics could be occurring on Europa’s surface, whereby subduction of an icy plate could release seismic energy into the ocean. Furthermore, the radiation environment in which Europa orbits may provide oxidants, also important for life, to the ocean; however, it is as yet unclear how much oxygen reaches the ocean. On Earth, biochemistry of life is built around a set of elements – C, H, N, O, P, and S (CHNOPS, carbon, hydrogen, nitrogen, oxygen, phosphorus, sulfur) – that are required by all known organisms. At Europa, the non-ice signatures at the surface (namely, the dark reddish surface material) could be signs of relatively recent interaction or exchange processes with the subsurface, and therefore could be tracers for biosignatures or other signs of life. Whether CHNOPS are available at Europa depends on Europa’s chemical evolution, which has likely been complex and energetic due to its tidal history and location in Jupiter’s radiation environment. Of importance, in considering how habitable Europa’s ocean might be, is the fact that Europa’s subsurface ocean is in direct contact with the rocky core. This is in contrast to Ganymede and Callisto, the other Jovian moons that also have subsurface oceans. The oceans of Ganymede and Callisto are sandwiched between ice layers, instead of between rock and ice as is the case for Europa. A rocky ocean floor, as is present at Europa and Earth, means that nutrients from the rocks are in direct contact with the ocean. Such chemical nutrients are imperative for the sustenance of life and could be leaching from the rock at the ocean floor into the ocean itself. 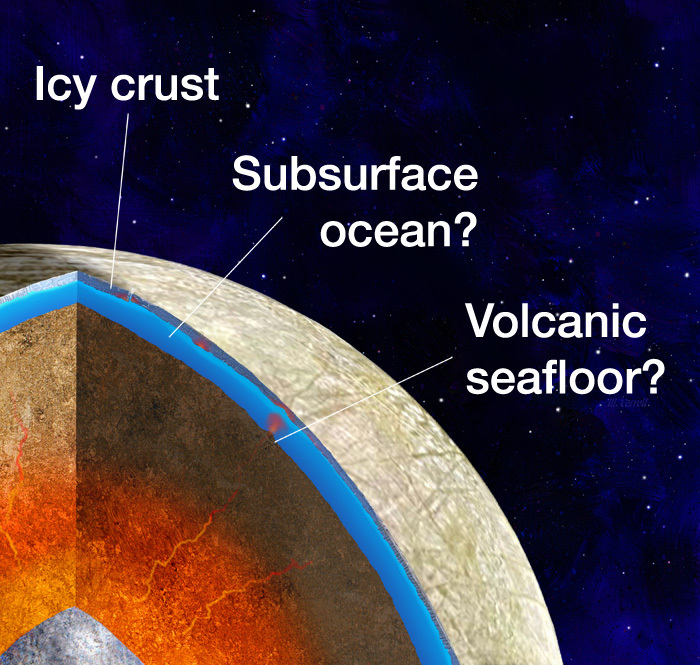 Outstanding questions about Europa's habitability relate to convention in the ocean. How is material cycled between the ice, the ocean, and the rocky ocean floor? Are the potential sources of chemical energy needed for life being actually available for use by living organisms? Answers to these questions can be addressed by future missions. After the discoveries of the Galileo spacecraft, the next critical step at Europa is to determine the habitability of the ocean. The next spacecraft mission to focus on Europa is NASA’s Europa Clipper, a Jupiter orbiter that will execute flybys of the icy moon. The current plan is to launch in 2022. The launch vehicle has not been finalized; it may be the Space Launch System (SLS), in which case the cruise to Jupiter would be ~2.5 years. If instead an Evolved Expendable Launch Vehicle (EELV) is used, such as a Delta IV Heavy or Falcon Heavy, the trip time to Jupiter would be ~7.4 years, utilizing an interplanetary trajectory with Earth and Venus gravity assist flybys. The mission at Jupiter will last ~3.5 years, during which ~42 flybys of Europa will occur; the concept of a Jupiter orbiter rather than a Europa orbiter allows the spacecraft to remain mostly out of the intense radiation environment close to Europa. The overarching science goal of the Europa Clipper mission is to explore Europa to investigate its habitability. To accomplish this, Clipper instruments will characterize the ice shell and any subsurface water, including studying ocean salinity and thickness and thickness of the ice shell using ice penetrating radar and dust measurements. Clipper will also work to understand the habitability of Europa's ocean by studying the composition and chemistry of endogenic materials on the surface and in the atmosphere, as well as in any potential plumes. Clipper also aims to understand the formation of surface features, including locating the sites of recent or current activity, and to characterize potential future landing sites. In addition to NASA’s Clipper, ESA is sending the JUpiter ICy moons Explorer (JUICE) to the Jupiter system, launching in 2022 with scheduled arrival at Jupiter in 2030. Ganymede is the focus of JUICE, but the spacecraft will execute two flybys of Europa. During these flybys, instruments on JUICE will investigate the non-ice materials on Europa’s surface and will study the thickness of the icy crust. A mission that could follow Europa Clipper and JUICE is a lander mission. A Europa Lander mission is currently under study, that would safely land on Europa – using reconnaissance from Europa Clipper – and take and measure ~5 samples from at least 10 cm below the surface, where radiation damage is likely to be much less intense than directly at the surface. The mission would last ~20 days. The goals of the mission would be to look for biosignatures, characterize the habitability of the region, and study the surface processes. One day, a robotic submarine may arrive at Europa to melt through the ice and search for and study life directly in the ocean. However, Europa’s ocean itself is considered inaccessible with current technology. Right now, chaos regions on the surface are likely the best bet to provide direct access to materials originated from shallow pockets of liquid water within the ice shell, or even the subsurface ocean itself. What are the chances of discovering life on Europa? On Earth, sunlight and photosynthesis have been critical to the evolution of complex life. So it is expected that any life detected at Europa – and/or at other ocean worlds – in the ice-covered ocean, would be of a simple form (microbes rather than “aliens”). Looking for and recognizing life on another planet will be challenging! We certainly have the Mars Viking experience to remind us of that. The Viking landers set out to detect life and found none, leading some to consider the missions as failures. In fact the Viking experiments could be considered ahead of their time, as the branches of life here on Earth were only just starting to be understood in the Viking era. At Europa, it is anticipated that no single measurement will provide sufficient evidence for the detection of life; the detection of life will require multiple lines of evidence. It will be important to not only detect and characterize organic compounds (which can be both biotic and abiotic), but to consider morphologic indicators (such as cell structures) and the context and location of potential biosignatures (how much radiation exposure? nearby a plume? etc.) Inorganic indicators (such as iron, sulfur) are also important to consider, as they can provide clues such as illustrating metabolic processes. Europa is an interesting ocean world in terms of habitability because its environment (namely, in Jupiter’s intense radiation field) is so harsh. As mentioned, Europa’s trailing hemisphere receives the majority of the plasma irradiation; the leading hemisphere incurs a lower dosage, though is not immune from some Jupiter radiation or galactic cosmic rays (GCRs). GCRs that strike Europa’s surface produce ionizing radiation, the effects of which can destroy organic biomarkers over time. It is estimated that, even on the leading hemisphere, any microorganisms within the top 1 meter of regolith　would be killed in less than 150, 000 years due to cumulative radiation damage; complex biomolecules would be severely damaged by ionizing radiation within the top 1 meter on time scales of 1-2 million years. Thus, the best chance for detecting life at Europa’s near-surface will likely be at a very young area, perhaps in a chaos region or nearby a plume (if present). In these locations, biomarkers could be preserved. 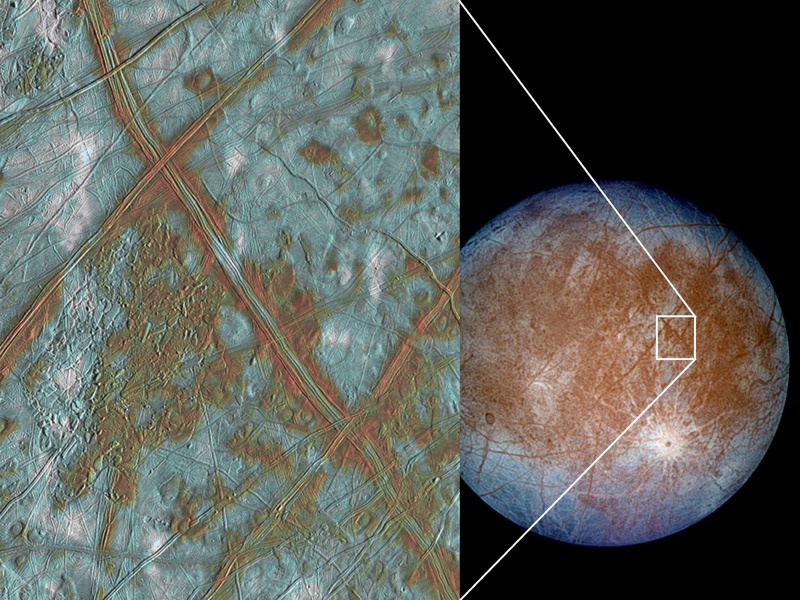 The concepts for future Europa exploration and the study of potential life are exciting. But let’s not forget that there are many ocean worlds, and potential ocean worlds, in the Solar System. Enceladus spews out ocean material into space via its south polar plume, making its ocean potentially more accessible than Europa’s; we have a good idea from Cassini data that Enceladus has the right ingredients for life. 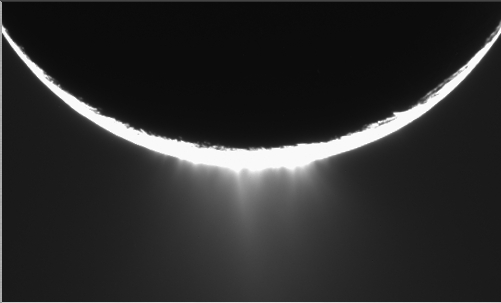 Enceladus plume. This image highlights the water ice grains being expelled in discrete jets from Enceladus’ south polar region as observed by the Cassini spacecraft (Image credit: NASA/JPL/Space Science Institute). At Titan, locations where possible active volcanism and/or large impacts bring in local heat, the ice could melt and interact with the abundant hydrocarbons, introducing oxygen to the hydrocarbons; such regions could stay relatively warm for tens of thousands of years. Could this be long enough for life to start? Neptune’s large moon Triton exhibits evidence of possible active plumes … could Triton host a subsurface ocean? In the quest to find life in our Solar System, we should strive to understand all of these ocean worlds – and look for life in all of the habitable, accessible oceans. If only one or two ocean worlds are explored and life is discovered (or not), we won’t fully understand the distribution of life, its origin and variability, and the repeatability of its occurrences in the Solar System. 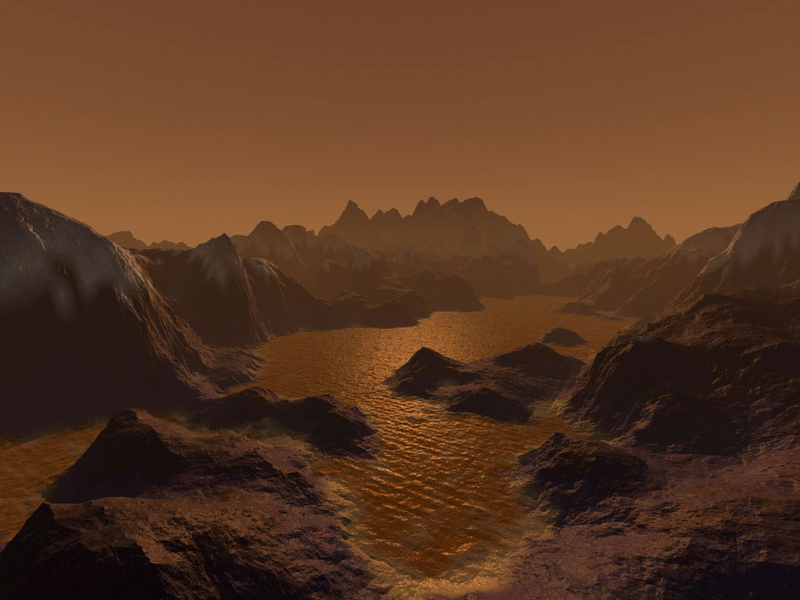 Artist’s conception of Titan lakes (Image credit: Steven Hobbs). And outside of our Solar System, there are more than 3,000 exoplanets that could be water worlds with subsurface oceans or that could have moons that are ocean worlds. So we have a lot of options for looking for life elsewhere! 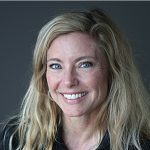 Amanda Hendrix is a Senior Scientist with the Planetary Science Institute in Boulder. Her research is focused on the moons of the Solar System. Dr. Hendrix has been involved in a number of pioneering space missions, including the Galileo, Cassini, and Lunar Reconnaissance missions.